Dirty upholstery is something we all have to deal with whether we want to or not. And these stains aren’t going to go away unless you dive in a start cleaning. However, these stains can be easily removed using some cleaning agents made with some house hold cleaners you’ll most likely already have around the house. Baby wipes are actually pretty effective when it comes to cleaning upholstery and they can be used to clean the majority of your furniture stains. This is because they contain a good mixture of both water and soap which is also gentle on the furniture. An upholstery cleaning foam can be very effective when it comes to cleaning furniture with the “W” (water based) cleaning code. This can be made by mixing 2 cups of warm water with one squirt of dishwashing liquid. You then want to mix the water and soap in a mixing bowl. An electric mixer would be ideal to mix since you want to mix it to the point that it foams up. Once the foam is created, you need to use it right away. This is not a cleaning agent you can keep around for use on a another day since the foam will eventually subside. 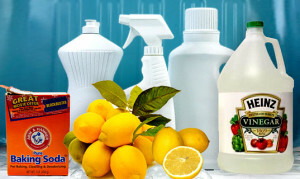 This type of cleaner will be good for most types of food, drink, dirt, grime and any other types of stains that might come up. Berry stains are perhaps the hardest to remove from fabric in general. They create a very strong bond to the material which is often times permanent. However, with this cleaner you have a good chance of either lessening the stain or removing it on a whole. This cleaner is made by mixing one tablespoon of white vinegar with 2/3 a cup of rubbing alcohol. Mix these ingredients together in a mixing bowl and use a clean cloth to rub the mixture into the stain. Once the stain is removed, use cold water on a cloth to wipe away the vinegar and alcohol mixture, then use a dry cloth to dab the area dry. An upholstery cleaning paste is an ideal solution for cleaning your upholstery if you don’t want to get it to wet in the cleaning process. Combine the baking soda and cornstarch together and sift them. Slowly add enough water so that the mixture forms a thick paste. Gently apply the cleaning paste to the strain you want to remove. Let the paste sit until it is completely dry, which may take about 30 minutes to an hour. When the paste is completely dry, use a brush to remove it and a vacuum to clean up whatever debris is left behind. Store bought upholstery cleaning agents are a great way to clean your upholstery as well and when in doubt, these are highly recommend to calm your fears. Store bought upholstery cleaners are specifically manufactured for cleaning furniture and will be much more effective and safe than home made upholstery cleaners. To figure out which upholstery cleaning agent is right for you, click here to see the reviews for the best upholstery cleaners out there.